Breed Group: Working Weight: 59 kgs Height: 69 cms Color(s): black with tan markings Coat: The Rottweiler has an outer coat that is short, straight, dense and of medium length. The coat should always be coarse to the touch. The undercoat should be present around the neck and thighs. Coat should never be wavy or curly. The Rottweiler has one of the most noticeable coats with the distinct black and bright rust coloring along their legs, underbelly and muzzle. 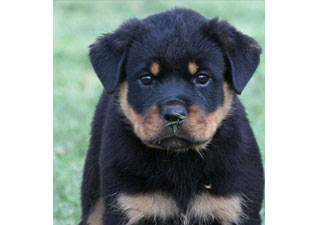 Distinct feature: The Rottweiler can be a very fun loving dog, however he is very powerful and can be serious at times. Early obedience training and socialization is a must. This breed can be very territorial and protective of their family and their environment. Rottweilers can be very intimidating, still retaining an undeserving reputation as a vicious and/or mean dog, however they do extremely well in a family environment. Temperament: The temperament of the Rottweiler can vary. Some can be very affectionate and somewhat of a clown, while others can be bullies. It is critical that this breed is socialized at an early age. Rottweilers can do well with children if raised around them, but should be supervised around small children due to their sheer size and power. The Rottweiler can do well around other dogs, however can be somewhat combative and can show aggression if not socialized properly as this is a very protective breed of both their family and their territory. Activity: The Rottweiler should have at least a large sized yard. They aren't really active indoors, so they need plenty of exercise outdoors, off lead preferably. This breed loves long walks and should have at least two long walks per day totaling at least two hours of exercise per day. Large Dog Breed Bull Mastiff .. English Mastiff ..French Mastiff.. Neopolitan Mastiff ..Great Dane.. St.BernardMedium Dog BreedAustralian Sheperd ..Beauceron..Belgium Shepherd.. Boxer..Chow Chow..Dalmatian..Dobermann.. German Shepherd..Golden Retriever..Grey Hound..Irish Setter..Labrador Retriever.. New foundland..Pointer.. Rajyapalam..Rottweiler.. Rough Coolie..Siberian Husky..SMALL DOG BREED Basset Hound..Beagle.. Bichon Fries..Bull Dog – English ..FrenchBull Terrier.. Chihuahua..Cocker Spaniel..Dachshund..Jack RusselTerrier..Lhasa Apso..Maltese.. Miniature Pinscher.. Pekingese..Pit Bullterrier..Pomeranian..Poodle..Pug..Samoyed..Scottish Terrier..Shih-Tzu..Tibetan Spaniel..Yorkshire Terrier..